Wilwood For Mazda MX5 MK1 MK2 Brake Kit Powerlite 4-Pot 270mm Kit Car BK36. 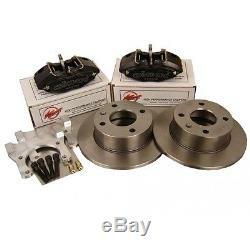 NEW - Mazda MX-5 Mk1 Mk2 Wilwood Powerlite Brake Kit BK36 - Race / Rally / Fast Road application. To fit Mazda MX-5 Mk1 Mk2, Kit Car Based Kit includes: 2 x Wilwood Powerlite Calipers 2 x 270x22mm Vented Disks 2 x Fitting Kit including Mounting Brackets, Nuts & Bolts, Fittings etc. Application: Mazda MX-5 Mk1 Mk2, Kit Car Based Caliper Type: Powerlite Lug/Radial: R Disc Size (Diam x Width): 270x22mm Possible Wheelsize (Inches): 13 PLEASE NOTE the following: Image used for reference only. Some components may vary from the listing image. Brake Pipes are not included Fitting Performance Brakes Kits is a task best undertaken by an experienced mechanic Please note, recently Wilwood have changed the colour of their callipers from black to grey. While we are working through our stock we cannot guarantee which colour will be available. This product has no reviews yet, however see what our buyers say about our other products..
All our listing prices include VAT. VAT invoice can be supplied with all orders. All goods are UK stock. These countries include, but aren't exclusive to, Switzerland, Norway, Malta, Canary Islands and the Greek Islands. Please allow extra time if you are paying by cheque. Additional charges may be incurred for Scottish Highlands and non mainland Britain. The following postcodes affected are: IV, HS, KA27-28, KW, PA20-49, PA60-78, PH17-26, PH30-44, ZE, BT, IM, TR21-25, EH, TD, JE, GY & TR. Motorsport-Tools UK - We are a growing dynamic company based in North Wales, specialising in Tools & Equipment for Motorsport and the Automotive trade. Our aim is to supply professional quality tools, parts and accessories at affordable prices. Our customers range from top Race and Rally teams in the UK and Europe to DIY Mechanics worldwide. We have our own warehouse and distribution centre with direct links to leading brands and manufacturers throughout Europe and the USA, enabling us to supply our products fast and direct to the customer. We pride ourselves on our feedback record and as you will see we always put you the customer first! All our listings include VAT at the current rate. Motorsport-Tools UK Llithfaen Pwllheli Gwynedd N Wales (UK) LL53 6NH. The item "Wilwood For Mazda MX5 MK1 MK2 Brake Kit Powerlite 4-Pot 270mm Kit Car BK36" is in sale since Tuesday, May 3, 2016. This item is in the category "Vehicle Parts & Accessories\Automobilia\Branded Automotive Merchandise\Clothing". The seller is "motorsport-toolsuk" and is located in Pwllheli.